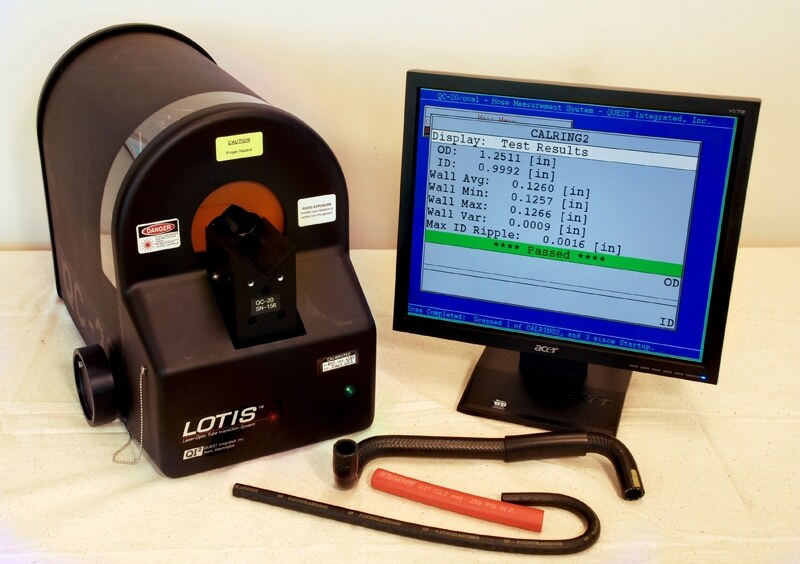 With its repeatability of ±0.0001 inch, the laser-based LOTIS® QC-20 has set a new standard in hose measurement precision. The QC-20 is the fastest and most accurate non-contact measurement system available for hose inspection. Operator error is virtually eliminated due to the QC-20’s precise, simultaneous measurements, which gages dimensions with no product distortion. Fast measurement = Higher throughput! 1600 equally spaced data points are captured with every data set. The QC-20 produces more data than any other system available – and does it faster. The operator simply places the hose section on the end and presses a button to record measurements, which takes only 4 seconds. The result is higher throughput rates and significant savings – realized through reduced labor costs, material waste and fewer returns and warranty issues.